Weddings can be expensive. The average cost for a wedding is around $27,000. I have heard about those who spend under $1,000 on their wedding, and those that spend $50,000. I even know of someone who spent approximately $250,000 on their wedding. We personally plan on spending around $10,000 to $15,000 on our wedding for around 250 people. Regardless of how much you plan on spending, there are plenty of common wedding expenses that you will probably have to add to the budget for your wedding. There are all types of wedding dresses out there. You may wear something that someone else handed down to you. You may buy your wedding dress used. You may buy a brand new dress. Usually, you can find many dresses in the $500 to $1,000 range. However, there are of course dresses out there that are in the tens of thousands of dollars. Along with the wedding dress, you may also spend money on alterations. Not all dresses are made perfect for you, and you may spend money on making the dress perfect for your size and/or changing something about the dress to make it more personal. In order to get legally married, you will need a marriage license most likely wherever you live. These usually cost between $20 to $80 from what I have seen. Some count the engagement ring as part of the wedding expenses, while others do not. Regardless of what you think, the wedding bands are still an expense as well. You can buy something simple or buy an extraordinary ring. If you are having a wedding with guests, then you are probably providing food as well. You will need to look into refreshments and possibly even a cake also. You can get a simple cake that you make yourself, or you may find yourself spending the average of $500 on a wedding cake. You might need to find a ceremony and reception venue as well. There are outdoor venues, indoor venues, churches, tents, all-inclusive venues and so on. Each has their own positives and negatives. We are having an outdoor ceremony and reception, with a tent for backup if it gets too warm or if it starts to rain. We are able to save money by having the wedding on a family estate, but we will have to spend money on a tent and all of the rentals. Surprisingly, the rentals will cost around $4,000, so we are not saving much by having it on family property. We do get more flexibility though as we can choose all of our own vendors, whereas with most venues some of the decisions are entirely up to them. Not everyone wants to have music at their wedding, but I know that I do! We are having a DJ, with a friend’s band possibly playing a few songs as well. Bands are usually more expensive than DJs. Another option for music would be to have dueling pianos, which are always fun. If you are looking to save money in the music category of your budget, you could possibly use your own music and plug it into speakers. The number one regret I hear from other brides is not having a good photographer. That doesn’t mean that you need to spend thousands on your photographer. It just means that you need to find the best value for yourself. Maybe you know of someone going to school for photography and you can ask them. You can probably also find someone to tape your wedding. If you have money to spend in this category, then it can feel like the sky is the limit. I have heard of people finding a quality photographer for $500, and I have also heard of someone finding a quality photographer for around $10,000. Research needs to be done. How much did you spend on your wedding? 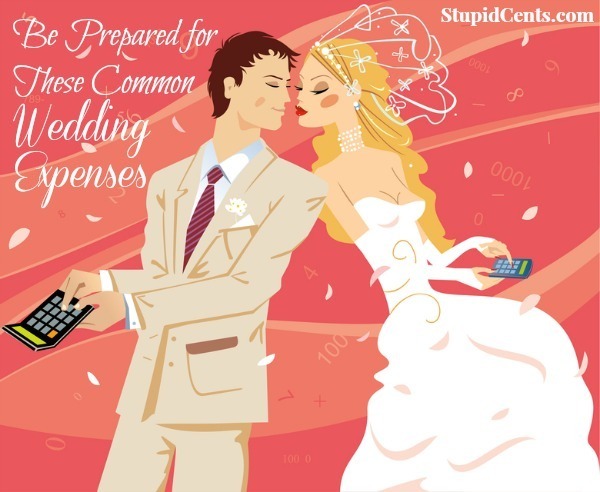 What uncommon wedding expenses did you come across? You know someone who spent $250K on their wedding?!?!?! OMG that’s a house out here! I’ve already told the BF to not spend too much on an engagement ring and we don’t plan on spending too much on our actual bands, either. It’s crazy how much some people spend on weddings! I know it’s such an important day, though. Good tips.